With Memorial Day weekend approaching and temperatures across the nation steadily increase to summertime highs, thoughts turn to picnics, ballgames -- and bug bites. Now, a new way of stopping mosquitoes could come from a precise method to interfere with their ability to hone in on people's blood. Before a mosquito comes in for a "fly-through" meal, it first has to feed on a sugary substance, usually from a flower. Then it uses carbon dioxide from a potential target's breath to locate a blood-filled host from up to 30 feet away. 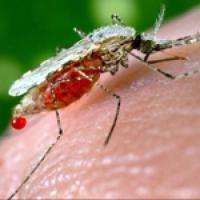 But as the hungry insect nears, malaria-bearing mosquitoes veer away from the face and move towards the feet, where they prefer to feed. Researchers have long believed that messing with the mosquitoes' sense of smell could hold the key to stopping their bloodlust. Remco Suer started by experimenting on the African malaria mosquito, Anopheles gambiae. He knew that prior research had found that human foot bacteria produce about ten separate odors, some more attractive to mosquitoes than others. Suer, who did the study as part of his doctorate in entomology at Wageningen University in the Netherlands, showed that these foot odors are detected by neurons that control smell, which are present underneath hair-like structures on the mouthparts of the malaria mosquito. Suer tested their sense of smell in the labratory by pumping additional CO2 into a container to simulate human breath, then added a high concentration of five different foot odors and found that the mosquitoes were unable to react to the CO2 for several seconds. The sole-ful odors actually stopped mosquitoes from sensing CO2 from breathing -- which could be a reason why malarial mosquitoes divert when honing in on a person and move instead to the feet at close ranges. But Suer pointed out that this doesn't mean people with especially funky feet are more likely to get nibbled on. "It is not the amount of odors produced, but which particular odors and ratio between them that makes a difference. Finding these odors and their respective ratio's brings us one step closer to manipulating the mosquito's behavior." It is this short-range orientation shift that may be used against the mosquito's sensitive nose. Suer thinks that better traps could be built luring mosquitoes into places that smell like feet -- and away from transmitting disease to human targets -- and started In2Care, a company he hopes will take the research and transform it into a low-tech product to help people in places where malaria is a danger. Of course, not all mosquitoes do the same thing, making it difficult to use a small array of odors to interfere with all species, said Daniel Kline, an entomologist with the Agricultural Research Service in Gainesville, Fla.
Kline, who called the new work exciting, said that where he lives there are 71 different species of mosquitoes -- each with its own habits. Some will choose the face or neck to bite, while others will attack cows over humans. "One size definitely doesn't fit all," Kline said. Kline's research has taken him to do similar experiments with dirty socks -- including a pair he wore for 12 hours per day, for three days in a row. "We actually got the female mosquitoes to respond to the socks," he said. Using the olfactory prowess of the malaria-bearing mosquito against it is a useful trick. Maybe gym-shoe odors could possibly do the trick. Please use "dictionary-check" as well as spell-check.